When people reflect on the really satisfying work days, they typically make progress on things that enable them to make a contribution to something important, to make progress on things they buy-in to and believe in, where there is alignment in some way to their values, to things they enjoy doing, or things that they are good at. On these days, things feel easier, we feel ‘lighter’ and ‘happier’. We’ve copied a link to this video below. Andre reflects back on how he felt about tennis, describing ‘Dragon’, the dreaded ball machine his father created to help Andre with his training. He talks about the impact his success or lack there of, on the tennis court, had not only on him personally, but on his father and the other members of his family. He shares how to have more success, he felt he had to work harder – and this was where he started feeding his ever-growing resentment towards tennis. Do they like what they do? Do they hate what they do? Have the found the reasons for what they do? 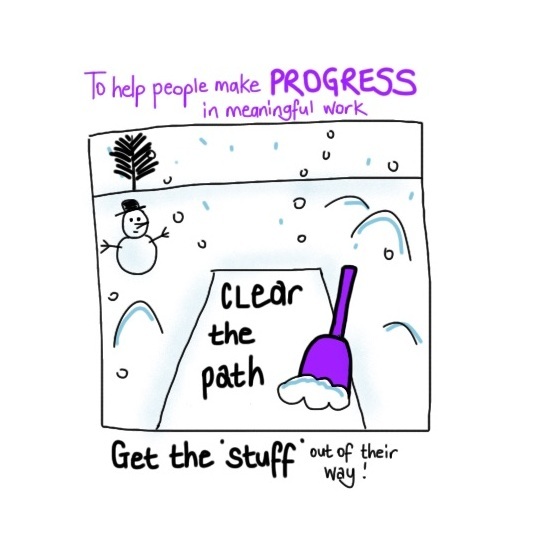 So… one job of a leader is to help get the ‘stuff’ out of people’s way so they can make their own progress in meaningful work, and the other job is to help them discover the meaning in the work they do. Help them see how they are contributing, help them see where what they are doing fits. Because as Andre shares with his story – there is quite a difference between ‘I have to’ and ‘I want to’. I have to for you. I want to for me. Wanting to makes things so much easier and lighter! ← Listening – an overlooked leadership tool?